I got some good news and some bad news. Let’s start with the bad news first: last month, I had the most amazing time attending the IDEA World Fitness Convention! I tasted AMAAAAAAZING food, got to snap a photo with Blogilates for a third time, and silently died inside while fangirling as I walked by Tony Horton of 22-Minute Hard Corps and P90x in the Marriott Hotel! So what catastrophe happened, exactly? Well let’s just say that I lost 99% of my video footage capturing the event and all I’m left with are a photo of Blogilates and I, a video of the POP Pilates class and a quick capture of me snatching a homemade protein chocolate coconut bar from the PlantFusion booth. Sad face with tears. So unfortunately, no YouTube video of the event this year, but that does NOT mean that everything is going to waste! That brings me to the good news which is I have an amazing new recipe comin’ yo way! And guess what?! This recipe also comes with a wonderful product review of a brand that is near and dear to my heart: PlantFusion! You definitely have seen PlantFusion on the blog before where I raved about their cookies n’ creme protein while making blender free ice cream (link to recipe and review right here! ), and I have yet to be let down by PlantFusion again because their new Phood whole food meal shake in chocolate caramel absolutely served more than well. In the photos above, you will see how amazing the nutrition facts are: 6 grams of fiber, 18 grams of protein, less than 1 gram of sugar, and 400-500% of the RDA of certain vitamins! And, there’s even probiotics! But rest assured that the ingredients of this superfood supplement are even better! I was thrilled to discover that this powder is made of completely wholesome and pronounceable ingredients such as oatbran, Lo Han Guo, amino acids and natural Stevia, but what I really appreciate about Phood is its diversity of ingredients. You’ll actually be consuming a few different vegetables that you wouldn’t normally find in a protein powder such as broccoli, artichokes, cabbage, watercress, kale and holy basil! And everybody knows that a variety of vegetables equals a variety of nutrients! While it isn’t ideal to consume general supplements instead of the whole food vegetables, this is an amazing way to get in even more micronutrients if it’s difficult for you to eat your veggies just as they are, or if you want to get creative! Speaking of getting creative, I concocted a recipe with this Phood powder that will absolutely BUH-LOW your mind. You all know that granola used to be one of my biggest vices since I’d eat seven bowls of granola in one sitting! Talk about an oil and sugar overload…EVERY single day. DO NOT tell me that “one simply eats a serving of granola and is satisfied” because it is NOT true. I was absolutely devastated when I stumbled upon a few articles that emphasized the health problems of overeating granola–I knew I was guilty of it. So for more than a year, I banished it from the house. I found that my cravings for granola totally disappeared and I embraced other breakfasts such as oatmeal, vegetable omelets as well as my mother’s homemade whole grain almond coconut pancakes. 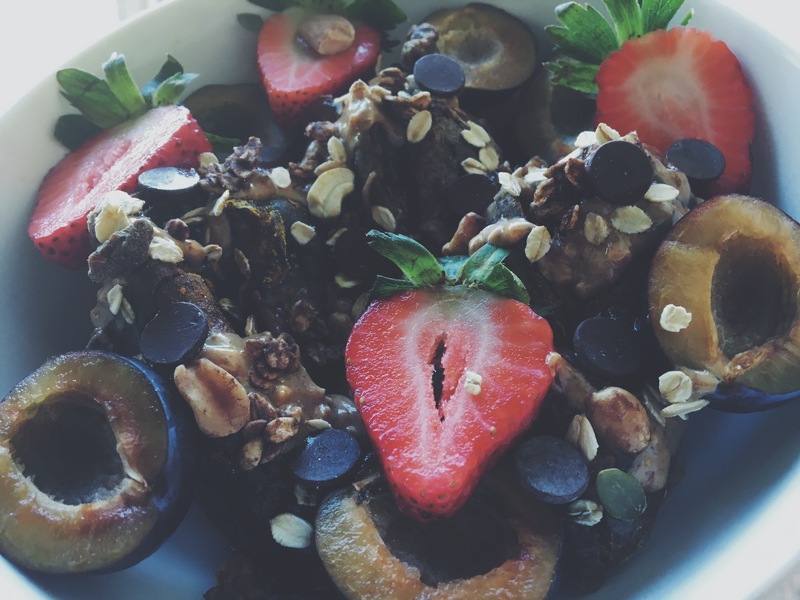 In May 2015, something prompted me to try granola again. I discovered that by treating granola as a condiment rather than a meal, I could incorporate it back into my diet. Eventually I did the same for grapes, and I was thrilled that I didn’t need to bar myself from anything and I just needed to be practical with my food! But this isn’t just any granola, no no no. Thanks to the Phood powder, it is is a POWERFULLY nutritious granola that is high in protein, high in fiber, high in vitamins and minerals, high in probiotics, free of added sugars, free of gluten, and free of soy! Can you get any better than that? I think not! Plus, this granola is totally customizable to your liking–you can add in more peanuts, no peanuts, fold in dark chocolate chunks after the granola has cooled off, sprinkle in some turmeric, and so much more. I was a little worried about the turnout, but the Phood shake does an amazing job at retaining its flavor and sweetness even after baking, so I could still enjoy its deliciousness in the granola! Please try this recipe out if you ever come across this supplement, and do not forget to check it out in the link at the end of this post! P.S. : I couldn’t help but taste a little bit of the “protein” batter made from the Phood shake and water combination, and it tasted amazing!! In a bowl, mix the Phood chocolate caramel protein powder with water until the consistency becomes thick and syrupy. Set aside. Take a large mixing bowl and stir all the dry ingredients minus the peanuts together. Slowly pour the Phood syrup mixture with the dry ingredients and stir the oats evenly. Repeat with the vanilla extract. Gently fold the peanuts into the granola. On a lined baking tray, spread the granola as far as possible to make a flat “blanket” on the tray. Bake for 22-25 minutes, flipping halfway through. Let cool completely and store in a dry, cool place for up to three weeks, or enjoy it fresh! Do you like eating a wide variety of fruits/veggies? Have you ever tried PlantFusion products?